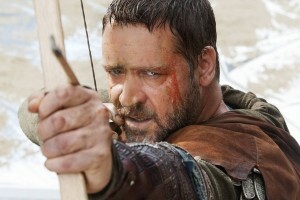 Ridley Scott should have made King Lear instead of Robin Hood. The plays of William Shakespeare have a timeless quality and the themes he wrote about almost six centuries ago still resonate with contemporary audiences. However, the question needs to be asked why, if Shakespeare’s plays have so much in common with modern audiences, are there so few films of his plays? I want to make a case against the two typical stereotypes of Shakespeare on film. Shakespeare’s masterpieces are either morphed into a sugary teen popcorn ‘flick’ that has little to do with Shakespeare or performed on what appears to be a similar set to a stage play with an insignificant use of the camera. Why can these two stereotypes not be merged into a commercially, and critically successful film? The problem is that the first stereotype, a viable commercial model, is not really Shakespeare at all. In 2006 She’s the Man hit cinema screens where it was billed as an adaptation of Shakespeare’s Twelfth Night. What She’s the Man seemed to achieve was to tell the story it wanted, which is largely about cross-dressing, and then throw in a horde of references to Twelfth Night. This could have been done to either a) give the film some shred of intellectual meaning or b) give the characters a reason to cross-dress or maybe it’s c) both. The film was commercially successful grossing $57 million worldwide which was an improvement on the $53 million that 10 Things I Hate About You managed to rack up in 1999. Again, this was billed as a loose adaptation of The Taming of the Shrew where the plot follows the conventions of a syrupy teenage rom-com but uses Shakespeare as a way to set it apart from the rest. Even still these are not ‘Shakespeare’ films. They are Hollywood films with a little bit of Shakespeare thrown into the mix. The second stereotype is equally dissatisfying. These films, it can be argued, do not have colossal blockbuster budgets because they prefer to focus on the language of Shakespeare without the frills and distractions of setting and scenery. The most recent film of Hamlet on screen was the Royal Shakespeare Company production in 2009, starring David Tennant and Patrick Stewart. This was not, by any means, a bad production of a Shakespeare play, on the contrary it was fantastic, but it was a bad film as there was nothing remotely filmic about it. 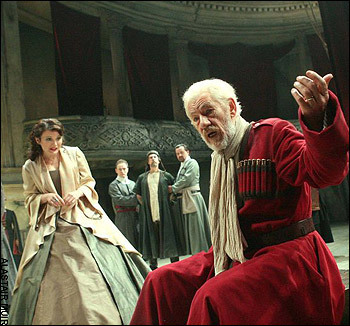 It was similar to the 2008 version of King Lear, starring Ian McKellen and directed by Trevor Nunn, which used the camera in such a plain way that it was akin to watching a stage production of King Lear on screen. Why is it that this application of classical Shakespeare cannot be placed in a high-budget Hollywood film? I am not advocating an increased budget for Trevor Nunn’s production. Instead, why can neither Hollywood nor Britain produce an English-speaking version of Akria Kurosawa’s Ran (1985)? Kurosawa’s Ran is a medieval depiction of King Lear and what’s thrilling about it is that in King Lear Shakespeare gives the filmmaker the platform to stage the numerous action sequences that are not available in the theatre. For example a war erupts between Britain and France in Act Four and the audience are only given the details of the battle before and after it has occurred. Now with the use of cinema imagine this war being filmed in the epic style of Ridley Scott similar to the opening action sequence in Gladiator (2000). Moreover this mix of commercial and mainstream success, in making a film out of one of Shakespeare’s plays, has been achieved before, where two specific examples spring to mind. The first instance is Franco Zeffirelli’s The Taming of the Shrew where, in one scene, Katherine (Elizabeth Taylor) literally rips apart the set to escape from Petruchio (Richard Burton) which distances itself from traditional stage recordings of Shakespeare plays. The second case is Baz Luhrman’s Romeo + Juliet (1996) which is exactly the type of film I am pining for. It is one that utilises classical Shakespeare with a blockbuster budget to achieve what is not feasible on stage. I do recognise that there are several problems with this idea. Firstly, one of the issues is that of the language, where it has been argued many times that the language of Shakespeare is not accessible to the masses. The previous examples of The Taming of the Shrew and Romeo + Juliet prove this is a false claim as they were both commercially successful. Secondly, the argument is always presented that Shakespeare is an auditory piece of work and not a visual one whereas film has an emphasis on the visual and not on the auditory. While it is true that during the original performance conditions the visibility (or lack thereof) of the stage led to an increase in the reliance of the language. However, what needs to be noted is that our society is no longer one that functions totally on our auditory perception but we use more visual stimuli now than we did five, let alone ten, years ago. This also applies to the theatre where Shakespeare is still performed. I am in no way encouraging the idea that the language is not important in modern films of Shakespeare but what I am noting is that the language should be used in conjunction with the visual nature of cinema, as both aspects are equally vital. It is the use of Shakespeare’s original language which creates this belief that his works are not a viable commercial model. However, it has been proved that adaptations can gross over $50 million and a film made directly from the source can gross over $147 million. The idea is simple: I do not want to see Shakespeare be placed on film. I want to see a film of a Shakespeare play. The two are completely separate from one another. I am advocating an increase in the amount of films that use Shakespeare to accomplish what the Royal Shakespeare Company is able to but on a grander scale. The art of the cinema should be utilised along with the power of Shakespeare’s language to create a new type of film that combines the best of the theatre and the cinema.